Oeuf cocotte ala Creme: Eggs cooked in a ramekin with heavy cream. I like to serve mine with fine herbs and toast points. Oeufs Brouilles: Eggs with cream cooked over a water bath until custard consistency. Oeufs Farcis Chimay: Eggs stuffed with mushroom duxelles and topped with Sauce Mornay. I just love these. Smoked and cured fishes: Mojito-cured salmon, Smoked trout with Horseradish and creme fraiche dill sauce. And of course Ham, sausages, bacons, Lamb Merguez and whole roasted Leg of Lamb. Some of my favorite potato dishes include Pommes Darfin. Pommes Duchess and Pommes Anna. Finish this feast perfectly with fresh fruits and Petit Fours, coffee, teas. Oh, and and don't forget to enjoy Champagne cocktails throughout. Happy Spring! Chef Janet's perfectly prepared Beef Wellington for your Valentine. Beef Wellington is an intricate endeavor. 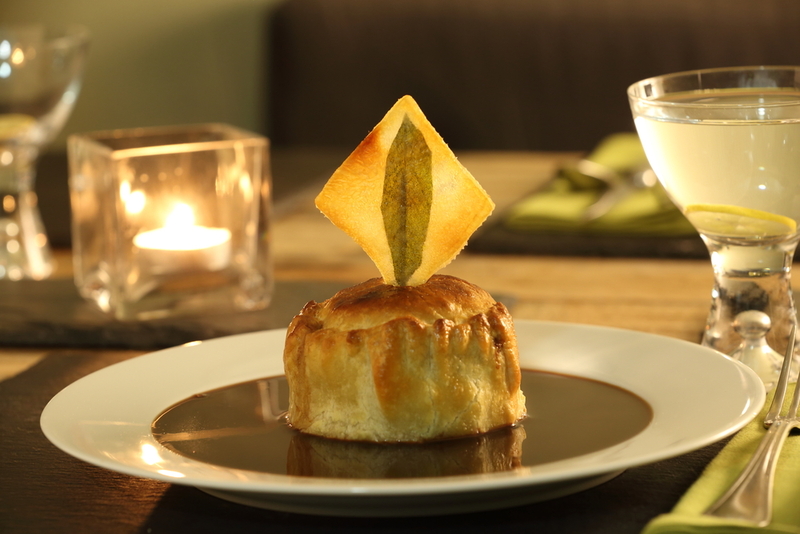 A thick cut of beef cooked to tender perfection while wrapped in a delicate, flaky pastry - filled with flavor and melting in your mouth - with a rich wine reduction sauce that just astonishes your tastebuds. A lithe Pommes Maxine perches atop. "Chef Janet brings to life the one cut of beef that naturally has the least amount of flavor by transforming it into an addictive dish that has as much visual appeal as it does taste - satisfying the quest for the ultimate beef experience." Are you ready for the ultimate beef experience? Are you ready for Wellington? Enjoy this dish prepared in your home for Valentine's Day - or learn to make this universal favorite and impress your honey, make your friends pine for it or treat the kids to a hearty reward for their great grades. These fall-off-the-bone ribs were slow cooked with sweet chili, ginger and lime. Pairs nicely with Yucca Fries served with sesame ginger aioli. Jelly fish salad with julienne of carrot, cabbage, cucumber salad with a ponzu vinaigrette. Some folks are afraid to try something new, delicious but not-so-run-of-the-mill...like pig ears. Hang on...H'ear me out. These are reeeeally delicious! Fried Pig Ears with Sauce Tartare and Mae Ploy. Add some Old Bay and Meyer lemon, and..... Ear-rresistible! What do you think? Like this post if you'd give these yummy Fried Pig Ears a try! Not to meddle with a classic story, but this story centers around FOUR very wise and extraordinary men. From left to right: Chef Alain Sailhac, Chef Jacques Torres, Chef Jacques Pépin, Chef André Soltner. They each autographed this book and gave it to me as a gift when I departed the International Culinary Center in New York before I moved here to LA to launch Chef Janet Crandall private catering. An entire industry has been built on the premise that creating gourmet meals at home is simple and effortless. But it isn’t true, says The Atlantic Magazine. Hint: Chef Janet Crandall can help. This issue of Grid Magazine features Chef Janet's butchery prowess. Perhaps more than any time in the past, Americans are aggressively asking where their food comes from and whether it's been produced justly. Read here about how Wyebrook Farm goes beyond the moving target that is "sustainable" farming. Ever handled a bone saw? Chef Janet conducts a carcass-cutting class to give students an appreciation for the whole beast and to learn knife skills. At Wyebrook Farm, Chef Janet was Chef and resident Butcher. Watch this short film about eco-centric Wyebrook Farm and Chef Janet's experiences there. The Wyebrook segment begins at 10 minutes 30 seconds. Read more about Wyebrook Farm here and more about Chef Janet's butchering experience there, here.